TWP 1500 Stain Reviews and Ratings for Consumers who have used the stain. Please Post a Review Below! The latest TWP formula is the new 1500 Series. It is now entering it's 4th year and has had some amazing results! 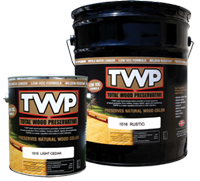 TWP 1500 Series Preservative is an EPA approved wood enhancing preservative that stops structural damage and exterior wood rot on treated or previously treated above ground wood surfaces such as fencing, decking, roof shakes, wood siding and log homes. TWP 1500 Series Stain will enhance the beauty of your wood and increase its longevity. The easy to apply formula and ease of maintenance will mean years of enjoyment from your wood surfaces. TWP is a registered trademark of Amteco Inc. Please write a review of your experience with TWP 1500 Stain or ask a question in the comment area below. Stay with the 100 Series for this fence in MO. TWA is good for cedar outdoor furhiture. Do you suggest 1500? The outside of the house is covert by red cedar new from 3 years and protect with Cabot timber oïl. The twa 1500 is it compatible for a renew application? The durability is it suprerior? Andre, unfortunately TWP is not allowed in Canada currently. I'm staining a cedar deck which I've completelt stripped of old finishes. What is the lightest color 1500 series I can use that will not obscure the grain of the wood. I want it to show through. I also want to ensure it penetrates and doesn't form a film. Basically, I don't want to have to go through the proces of stripping again. Will 1500 do it? All TWP 1500 colors will show the wood grain and will not hide it. They also penetrate and do not film when properly prepped and not over applied. Honeytone is the lightest tint. I have a Cedar Deck with two coats of Cabot Semi Solid Stain (from the previous owner). I am planning on using TWP 1504 Black Walnut. After two applications of Restore A Deck Stripper and power wash, approximately 90% of the stain is removed on the main deck (horizontal) but the steps still have a significant amount of the old stain and the vertical rails are still covered with stain. I am not sure what to do next, I am thinking of removing the wood rails and sanding everything including the main deck to get all the old stain off. I will rent a plate orbial floor sander for the main deck and buy a 5" Orbital sander for the rest along with a detail sander for the nooks. However, I was told by someone that sanding a deck would create marks and uneven stain patterns when dry. Please advise on what I should do next. Stip again and again until the old stain is gone or sand. Probably best to sand it off at this point. Great news and thanks for sharing! We live in Washington State where it rains a lot and after the winter everything outdoors is covered by a layer of mold, mildew, algae, or moss. We completely sanded down our very large cedar deck last summer after another product remained tacky and the deck was totally black by spring. We applied two coats of TWP 100 and this year for the first time in over 25 years I will not have to power wash or scrub the deck to make it presentable for the summer. Except for the dirt that the raccoons tracked on it, it looks the same as it did right after we applied the TWP. When they say it resists mold/mildew (the reason we purchased this product) they really mean it. It was money well spent and we have a whole unopened 5 gallon can and several gallons from the first one left to redo it when it becomes necessary. Thanks for the great product! The rustic brown TWP 1500 really faded (from brown to red) in a year on our redwood deck. Was supposed to have better fading/UV resistance. I just put in my order for 5 gallons of 1500 redwood stain and deck cleaner this past Thursday evening, and it showed up at my door Saturday afternoon! You guys rock. Once I apply my stain, I'll write a reveiw of the product. Thanks for the expeditious delivery!